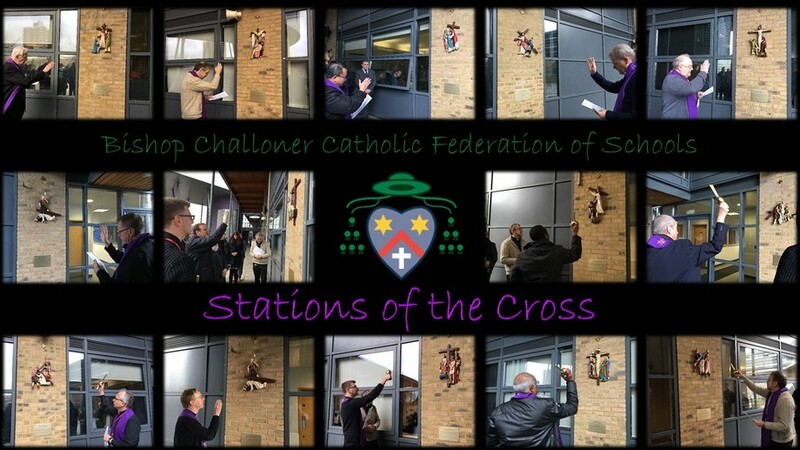 New and specially made Stations of the Cross at Bishop Challoner Catholic Federation of Schools were unveiled and blessed by priests from all across the Deanery. The ceremony on the 20th February was led by Rev. Keith Stoakes, Dean of Tower Hamlets with the help of the school’s Executive Headteacher and Chaplain. Each of the 14 stations in the playground is dedicated to a parish, chaplaincy or religious community in the Deanery – celebrating those communities themselves and the schools place as one of them. Throughout the Lenten seasons students will process the Stations, praying for all those within our communities and for peace, reconciliation and forgiveness both locally and around the world. This is the start of an annual tradition at Bishop Challoner. Mr Fitzgerald, Executive Headteacher said: “It is part of our mission to ensure that the presence of our faith is experienced in all that we do. Obviously the physical environment of the school plays a very large part in that and having these stations of the cross erected has helped us to make that faith evident. Not only because they are physically present (and do look very good – particularly when lit up at night) but because they have allowed us to take part in school, in an important part of what goes on in a church at this time of year.